The European Central Bank QE (quantitative easing) regime is officially in full swing. European Central Bank data released last Friday indicated as much. The sovereign bond-buying program began March 9. And in less than two weeks, Eurozone central banks had already purchased 26.3 billion euros ($28.9 billion) worth of these bonds. At the same time, economic indicators seem to point toward a recovery. Markit's Purchasing Managers' Index data released yesterday (Tuesday) revealed Eurozone businesses are at their most optimistic in four years. The EURO STOXX 50 Index – the leading blue-chip index for the Eurozone – is up 21% in 2015. And what's more, it's at nearly seven-year highs. Even the beleaguered euro has stepped off a bit from the precipice of euro-dollar parity. This morning, it was trading at $1.0967. This is after falling to $1.0484 on March 15. This positivity in Eurozone markets all seems unwarranted. The Greek debt crisis, perhaps the biggest problem facing the Eurozone right now, doesn't have a solution. And Eurozone QE was never built to address it. 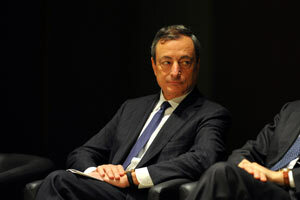 Eurozone QE is a "confidence trick," Financial Times columnist Wolfgang Münchau wrote on Sunday. Positive economic data came as a result of falling oil prices, which provided a windfall to the Eurozone, the world's largest net importer of oil and gas. And those benefits are easily wiped away by any surge in oil prices. It's hard to actually be bullish on the Eurozone even with economic data providing a thin veneer of Eurozone confidence. The situation in Greece is worse and more contentious than it has ever been. And QE, a policy aimed at bringing on a recovery, is hardly what it's cracked up to be. The benefits of Eurozone QE are illusory. This surge in Eurozone optimism is built on a false premise that a largely impotent policy will be the saving grace for a struggling Eurozone.